In dense suburban environments space is often at a premium, and as such many homes have relatively small gardens that require far less of an investment, both financially and in time, than larger gardens. Never the less if you own a small garden then you’ll probably still want to get the best from it, and that includes having the proper tools to enable you to care for it properly. Enter, the electric lawnmower. 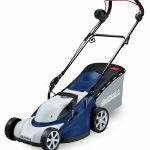 Below the mower comparison guide you’ll see some information on what to look for in an electric lawn mower, as well as excerpts from more detailed reviews. Please have a read through the full review if you see something of interest. Let’s be honest there are some things in life that we buy because we feel we should, not necessarily because we need them. Hi-tech, high-powered devices are often seen as must haves, over just as serviceable but more humble equivalents. Lawn mowers are no different, with many people rushing out to buy a petrol mower when an electric one will do just fine. 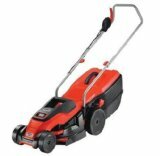 Besides this, electric mowers actually have many distinct advantages over petrol mowers, but if you’re unsure about the advantages and disadvantages of electric mowers compared to petrol mowers then do take a minute to read the advice at the bottom of our homepage on whether to choose Electric or Petrol to get further information. 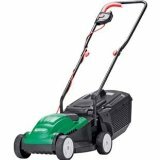 Electric lawn mowers have existed for many years as the middle ground between the more powerful petrol powered mower, and the laborious manual lawn mower. They are favoured by many consumers for their cost effectiveness, a simplistic design that doesn’t demand a great deal of maintenance, and their compact and light weight nature, making them ideal for use by the young and old alike, and those with only limited storage space. Due to their limited size and power limitations, it’s quite normal to require other tools in combination with an electric lawn mower, such as grass trimmers and edging tools, to help with particularly tough and hard to reach areas that are beyond the reach of the lawn mower blade. 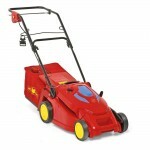 However petrol lawn mowers also suffer from the same limitations in many cases. 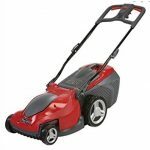 The best electric lawn mowers will address all the limiting factors in terms of size, weight, power, and overall performance to provide a well rounded solution that suits your needs perfectly. Of course, what suits you and what suits the next person’s needs will differ on any number of factors, but making the choice to go with an electric mower is of course the first step. So if you know that you’re firmly in the electric camp then let’s continue on and see what features to look out for when buying the best electric lawn mower to suit your needs. 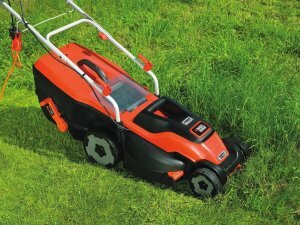 A decent cutting width – Petrol mowers tend to be for larger lawns, so their cutting width can be anything from 40cm to 50cm, with electric models you’ll see that somewhere in the region of 37cm to 42cm is standard, which is more than adequate for cutting a small lawn in a reasonable amount of time. Any less than this however and it starts to make the task a bit too laborious. Sufficiently powerful motor – Electric mowers may be for smaller lawns but that doesn’t mean that smaller lawns aren’t without tough areas or wet grass, both of which can be quite demanding on the motor. 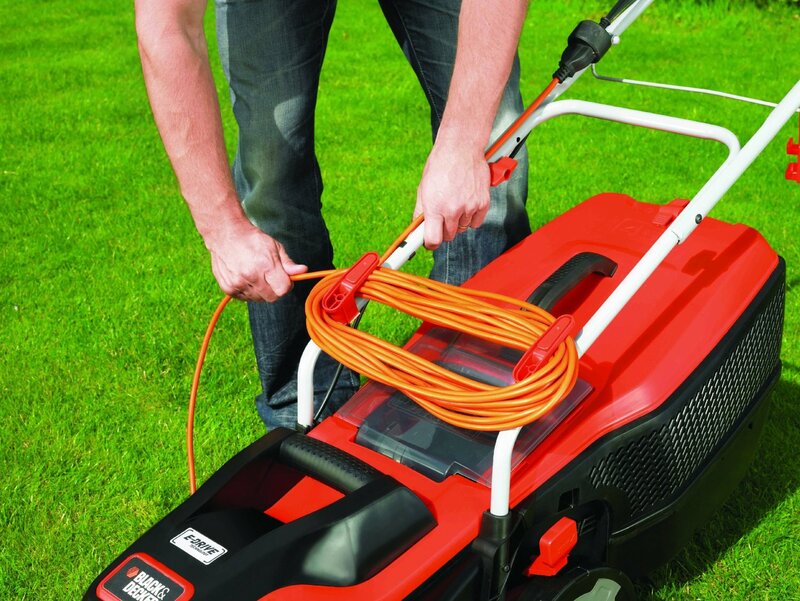 To be sure that your mower can cope with all reasonable challenges, opt for one with at least 1300 Watts of output power. A decent sized grass collection box/bag – Given that electric mowers are typically designed for use in gardens of less than 400 square metres then it’s unlikely that you’ll need to empty the grass collection box more than once in a session, therefore a box of somewhere in the region of 30 litres capacity is going to be more than sufficient. Steel cutting blade – plastic blades may be cheaper but they have a much shorter working life, a steel blade can be sharpened again and again to maintain optimum cutting performance. Cutting height adjustment – Again not as necessary for smaller lawns, but you’ll need this feature if you aim to do more than just keep your lawn cut short on a regular basis. If you’ve got uneven or overgrown areas then you’ll need to be able to set the cutting height up high, and if you want to crop the lawn shorter then you’ll need to be able to set it lower. Most wheeled rotary mowers come with a simple means of adjustment to do this, but you might find it more of a task with a cylinder or hover mower. Battery power – There is no denying the improved freedom that not having a cord trailing behind you will provide, but this comes at a price, normally 4 times the price to be exact. 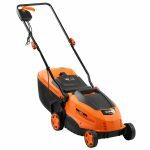 Also bear in mind that you’ll have the increased weight of a battery on board to contend with, this takes away the normally great benefit of electric mowers being at least half the weight of their petrol counterparts. For more detailed information check out our guide to the best cordless lawn mowers. 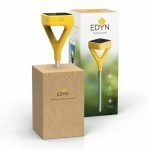 Ergonomic controls – It’s definitely a massive help to maintain comfort and ease of operation for all sorts of reasons, but if your lawn is really quite small indeed then this is probably an area that you can afford to skimp on. Warranty & Support – No one ever plans for the worst to happen, but it can be reassuring to know that help is at hand if it does. If your lawn mower breaks then you’ll need to get it sorted or else your lawn will grow out of control! Check carefully what each manufacturer can offer, most will offer some level of support, but others are better at it than others, with full on-line support showing service centre locations, and detailed trouble shooting information, whereas others only have an email or phone number which might not always deliver the most timely response. Special cable management mechanisms – Some electric mowers feature clever ways of keeping the cable out of the way to avoid you accidentally running over it. A great idea but by no means essential, or a substitute for being aware of where the cable is. Edging features – Some electric mowers feature fittings designed to be able to take the mower right up to the lawn border, thereby eliminating the need for additional shearing or strimming. Again a great feature but not essential. 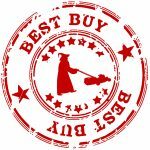 So, armed with your overview of knowledge on electric lawn mowers the next step is to look in a bit more detail at some of the best examples on the market today where you can take a view on which is the best electric mower for you. 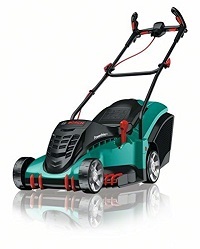 A highly rated and proven machine from one of the most trusted names in consumer products and electricals, this Bosch electric lawn mower features just the right combination of innovative features and cost effective, sensible design suitable for use by the fair weather gardener. 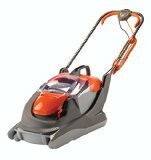 If you’re after a modern electric lawn mower that’s packed full of innovative features to make your life easier then look no further than this great product from Black and Decker. If you’ve read our introductory page you’ll see that we’ve dismissed most hover type mowers as ineffective due to their integral grass box making the payload of the mower variable, which therefore reduces the ‘hover height’ of the mower and could leave it scraping along the ground rather than gliding effortlessly. This isn’t the case with hover mowers that don’t have an integral grass box (as is the case with this one), as no grass is collected the payload does not change.